Our Little Smart Family: Weekend as a Family of 5!!! Weekend as a Family of 5!!! My sister Amy and her hubby Mike went to Hawaii for a week and we got to watch their kids Owen and Emma for a few days! We had a blast. Nightly pajama dance parties on our bed, playing at the park, eating good food, hot tubbing and swimming and a visit to a Science/Dinosaur Museum. Happily sitting together one of their rare moments-these girls fight like sisters. But when they do get along it is so fun! 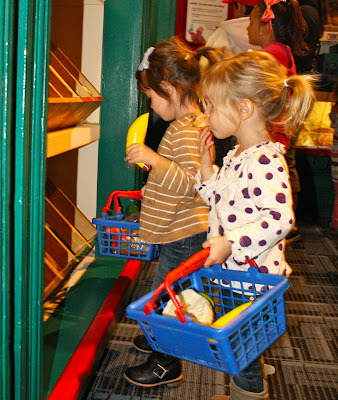 At the Discovery Science Center. Camryn loves Owen. I wish I could have gotten on camera the times Camryn would put her head on Owen's shoulder and when they did the "spider" on the swings at the park-they both couldn't stop laughing! The girls shopping together. This is what I picture when they are away at college together. 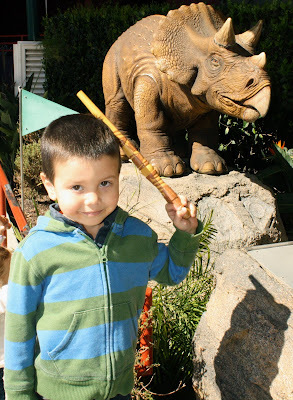 Owen with his Triceratops-his favorite Dinosaur, he did not want to leave this spot he was so obsessed. This and the 4-D dinosaur movie made his whole day! Cuddles when Uncle Ryan. He was such a good uncle, Owen definitely had the best time with him. And a before church shot of the girls! Another time where they were loving each other! They are so cute all dressed up! Do they look alike? So many of my friends thought so. Probably just their body-types and that they like to dress alike! So glad we were able to help Mike and Amy out while they were gone and had so much fun doing it! I plan to do this a least once a year, a tradition I think the kids and parents will love! Stop it!! Those kids are too stinking cute, totally dying. So glad you posted about your fun weekend - I've been thinking about you having fun with the kids and knew you would be having the best time! The picture of Emma and Camryn dressed up should go in a magazine!!! And I love how much Owen and Uncle Ryan became such good buddies. You are one amazing aunt! going to be a family of 4 soon, so not too far off! looks like it was a fun weekend. darling kids. What a fun weekend! While I totally don't think the girls look alike, I'm sure they will be forever buds and will cherish these times! Even though they might not remember this one when they are older...they will love looking back at the pictures! I love museums! Great fieldtrips! So cute. Camryn looks like she's in heaven with a couple extra little people around!! I'm dying also!! I LOVE that my kids LOVE you guys so much! 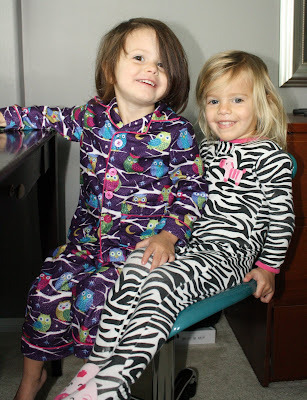 Emma and Camryn on the desk chair... how did you get them both to smile?? Cute glimses into their future. Next time we ever do this, remind me not to pack anything for Emma... Camryn's clothes are way cuter :) LOVE her Sunday hair, did she keep the headband in? Oh wow. Those two girls are too cute! Gotta love cousin time. Ok so maybe it is the Happiest Place on Earth! Who Says Ties are For Boys?